You gotta admit, it sounds pretty good. But as ever, the question we really want an answer for is: does it deliver? Well, this app is certainly easy on the eye. Everything is nice and big and clearly laid out on the main screen, with just a few other minor items in the non-intrusive little side menu. I don’t have time to go through all of the various functions this app is capable of (most of them just do what they say on the tin with no fuss) but I do want to highlight a few things that have jumped out at me. 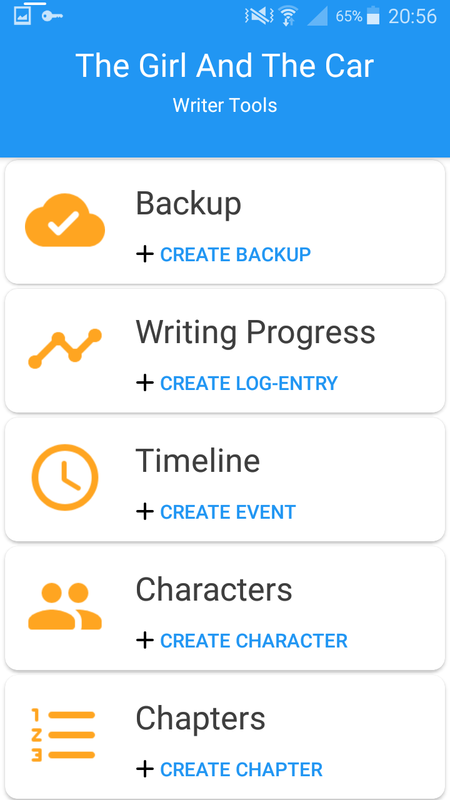 While this app is designed for both planning and writing your novel, it definitely comes into its own most of all at the planning stage. 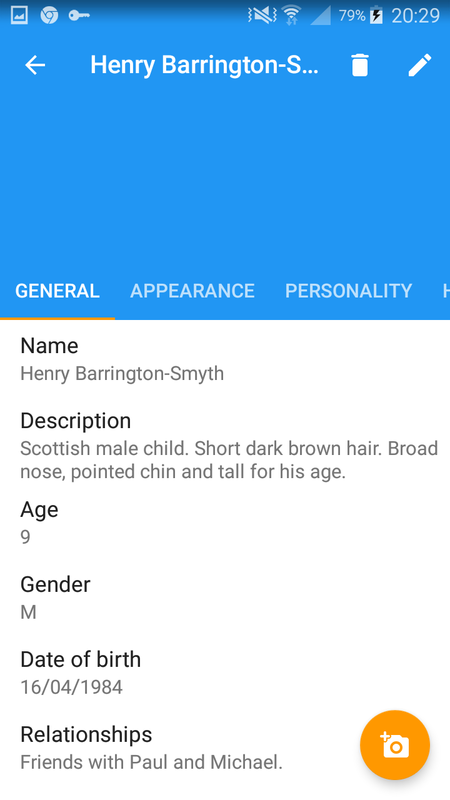 The ‘locations’ feature, for instance allows you to sketch out various key settings for your story, however this app also boasts a sub-location function, allowing you to create an infinite number of locations within locations within locations within locations. This is especially handy if you’re writing a fantasy, for instance, and you want to sketch out everything from an entire empire right down to your protagonist’s bedroom and everything in between. Another handy planning feature is the ‘custom lists’ feature. Suppose you’re wanting to create a list of all the magic spells, classes of starship or possible murder weapons included in your story? Well, now you can! Simply come up with a name for your list (e.g. : ‘starships’) and what fields you want to include in each list (e.g. 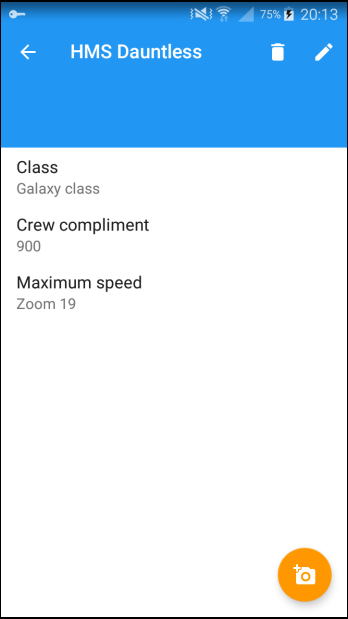 : ‘size’, ‘crew complement’, ‘engine model’, ‘maximum speed’, etc.) and hey presto! 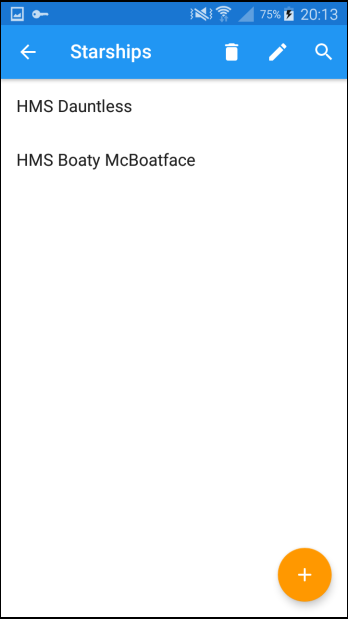 You’ve got yourself a custom list complete with custom metadata. Best of all, it’s a doddle to do. 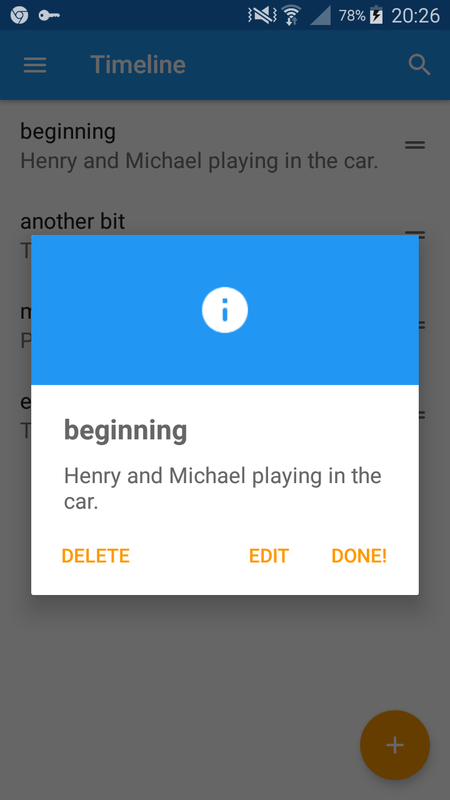 This app also allows you to sort your story into chapters, scenes and, of course, to write the actual narrative. All very good, but one thing I did find a little bit odd was the fact that the scenes are nothing more than a list of scenes. When you write the actual narrative, it’s completely divorced from the list of scenes you’ve created, so you end up with just a single block of narrative for each chapter. Not a huge problem, just seemed a little strange to me. There are adverts, as with so many apps these days. Specifically: small banners at the bottom of the screen which don’t really get in the way and full screen ads which appear only occasionally. The free version does also contain a few other niggling limitations, such as only being able to create one project at a time (definitely its biggest let-down!) and the fact you can’t add images (if you’re the sort of person who likes to do that; personally, I’m only inclined to do that with character profiles). All in all, this app is actually pretty good and the few limitations there are can be easily overturned if you’re willing to spend a bit of money on the pro version, which does everything the free version does but it also allows you to create multiple projects, access all your previous back-ups, download your story as a PDF, add images, remove adverts and includes night-mode. Well, that is certainly your prerogative. I was quite tempted to buy it myself until I saw the price: a monthly subscription of £4.99 or an annual subscription of £54.99 (which gives you one month free). Personally, I think that’s a bit steep for the fairly limited benefits the pro version gives you. A one-off payment, sure, that I would go for, but I don’t think those benefits are worth paying a regular subscription for. Heck, you’d be cheaper just buying Scrivener! All in all, this is a fantastic app. It is both easy to use and is one of the most powerful mobile tools I’ve come across for planning and, to a slightly lesser extent, writing your story. It’s just a shame the pro version is so expensive.